The perfect addition to your front porch! 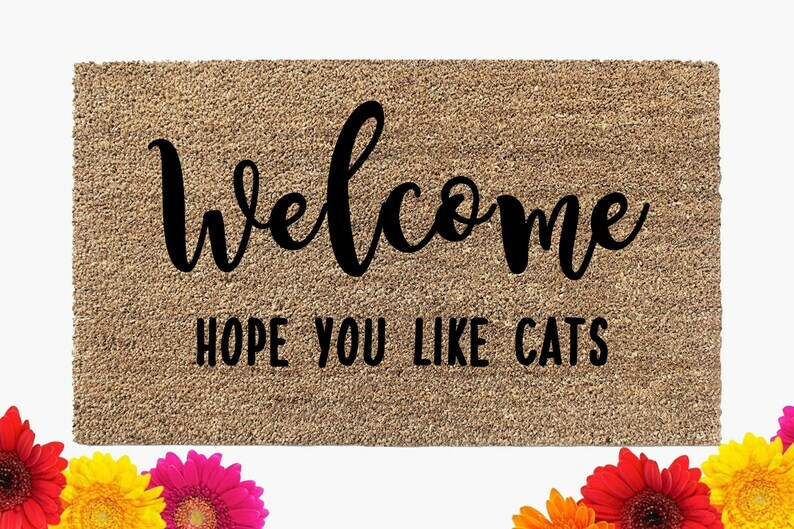 This doormat will come as pictured and states "Welcome - Hope You Like Cats." Doormat is made of natural beige coir that will help keep mud and dirt from tacking into your home. The doormat has an attached rubber backing to keep the mat in place. We suggest you keep mat as dry as possible to keep it looking its best, but it can handle plenty of foot traffic. Just shake occasionally to clean. We hand paint our doormats in Austin, Texas. Made from 100% natural coir material. Sending this as a gift? We are happy to include a custom gift note with any order. Please let us know what you would like the note to include in the notes section at checkout. Looking for a custom doormat? Send us a message.